It’s the little tricks and tweaks that make using a device exciting and the iPhone is no exception. For Apple users, this involves simply knowing about the OS and then exploiting or effectively using certain features or aspects of it. 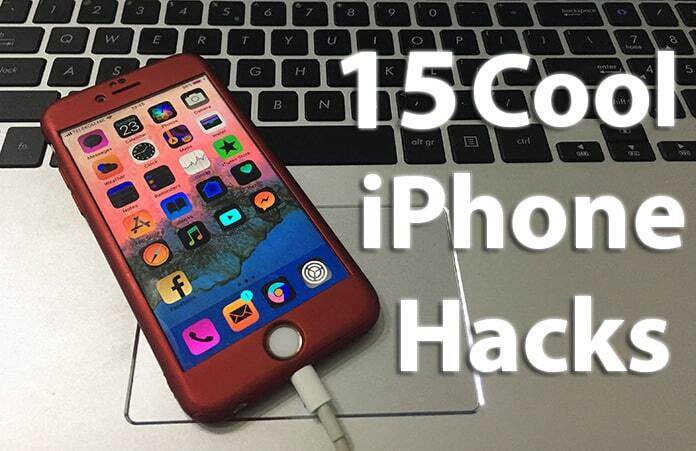 Here, we will take a look at some of the cool iPhone hacks and tips. Everyone loves hacks but not in the computer hacking sense. 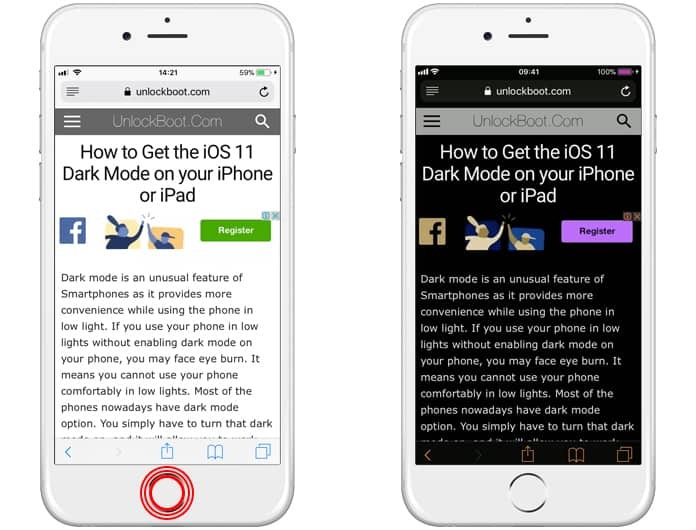 So in this article, we want to talk about the iPhone hacks and tips you should definitely try. Launch the Compass app and then swipe left. There is a brand new tool waiting there to be discovered. 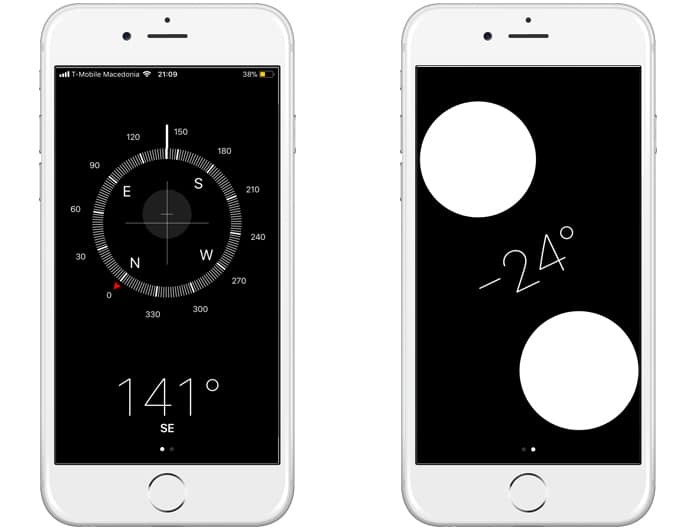 What it does is help you set a level by displaying degrees. Let’s say you accidentally deleted some important text. Just shake the phone to undo your last action, easy! Go to Settings -> Camera and enable the Grid feature. What this will do is that whenever you go to the camera app you will find a crosshair in the center of the screen when you point your camera downwards. Match the crosshairs till they overlap; this will signify that your phone is perfectly level with a surface. Since Apple got rid of the App Store section from iTunes in iTunes 12.7, it isn’t possible to backup and install apps by using iTunes any longer until and unless you downgrade. However, it is possible to use certain tools such as AnyTrans which will back up and install apps on your Apple device without using iTunes. The freedom it affords even extends to backing up and exporting iMessages, which normally isn’t possible even with iTunes. The Plus models are quite large and can be hard for someone with smaller hands to manage. So, in case you are having trouble pulling the screen down from the top just tap the Home button twice in quick succession and the screen will slide down on its own. 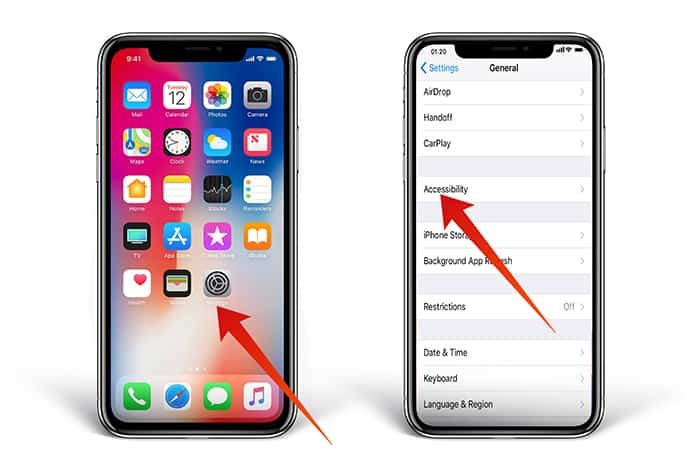 The iPhone X, however, requires that this feature be enabled by going to Settings -> General -> Accessibility. 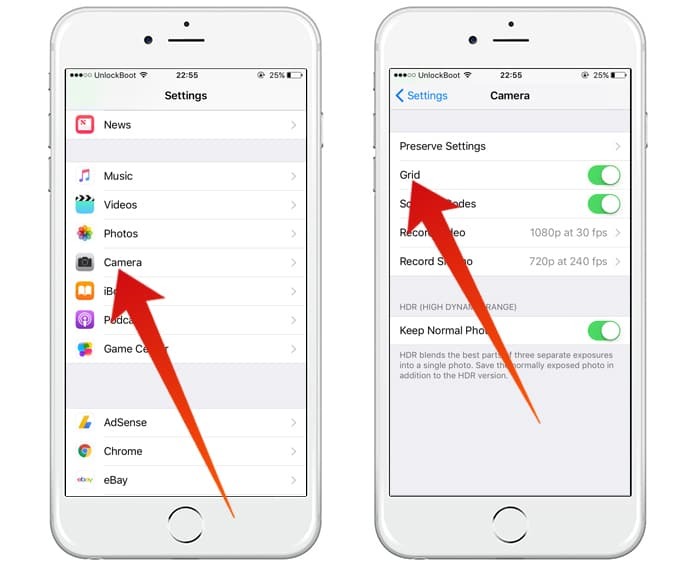 Tools like FlexiSpy can be used to remotely track an iPhone’s activity. This is a great thing to have if you are a parent and have little kids. The only thing that is required is the device’s iCloud login. There is no prerequisite for any software to be installed on the iOS device beforehand. It is also possible to perform the reverse of asking the device to read some text out loud. Any time you don’t feel like typing just tap on the small mic icon in the bottom right of the keyboard and start talking. The Diction feature will convert whatever you are saying into text. 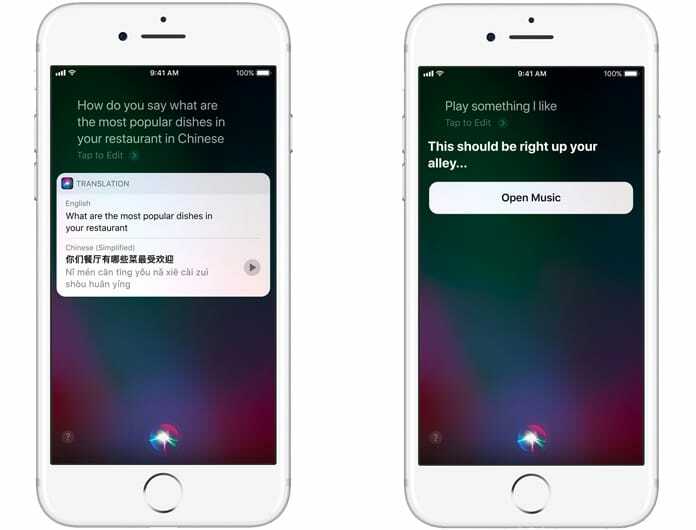 Siri is an AI that isn’t capable of giving an answer to each and every question, it isn’t like a Google Assistant. However, Siri is great when it comes to accomplishing tasks you set it. This is all the more true for tasks using iOS’s stock apps and it is able to do that quite well. You can ask Siri to message someone, or WhatsApp them or call them. It is even possible to ask it to add things to a shopping list, set an alarm or toggle Bluetooth on or off. Everything it does is quite reliable. iOS is fully capable of detecting any sort of text, reading it and then reading it out loud. 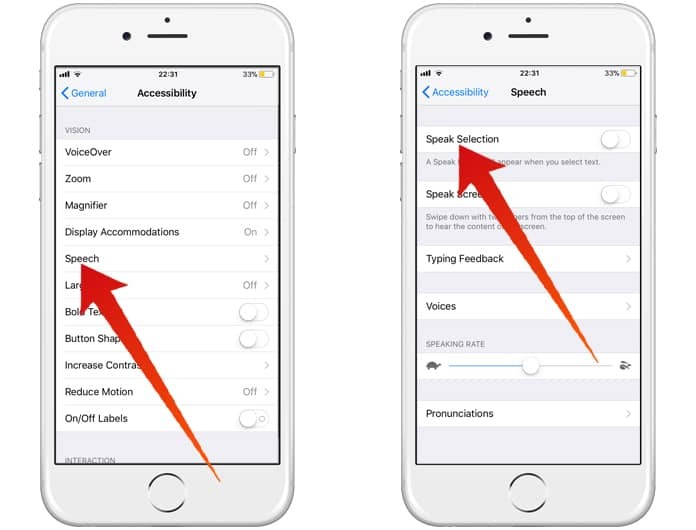 Just go to Settings -> General -> Accessibility -> Speech and turn on the Speak Selection and go to Speak Screen. The next time that you are working on a long article and want to read it out loud, just swipe downwards with two fingers and the iOS will begin reading everything as it appears on the screen. If you happen to possess the iPhone 6S or newer, the iPhone will have a 3D Touch feature which allows you to press deeper on the screen for a different function. You can do this to access quick shortcuts. The keyboard itself is a prime location for this, since pressing down there will turn it into a trackpad; you can move your finger in any direction and the cursor will as well. Just press deeper again to select text as you move your fingers. 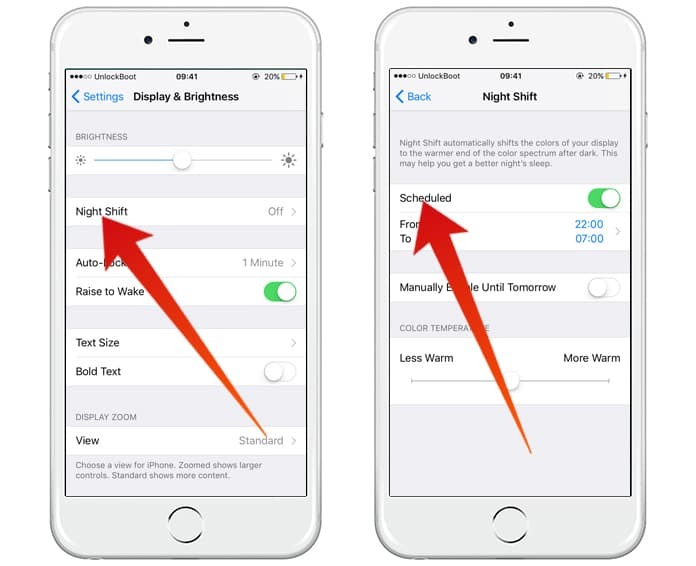 This creates a yellow tint over the screen at night and can be accessed by going to Settings -> Display & Brightness -> Night Shift. It’s great for people who like to read in bed. The iOS 11 introduces a Smart Invert feature which brings a new dark mode to the table; all it does is turn the white background black and black to white. To enable just go to Settings -> General -> Accessibility -> Display Accommodations -> Invert Colors -> Smart Invert. 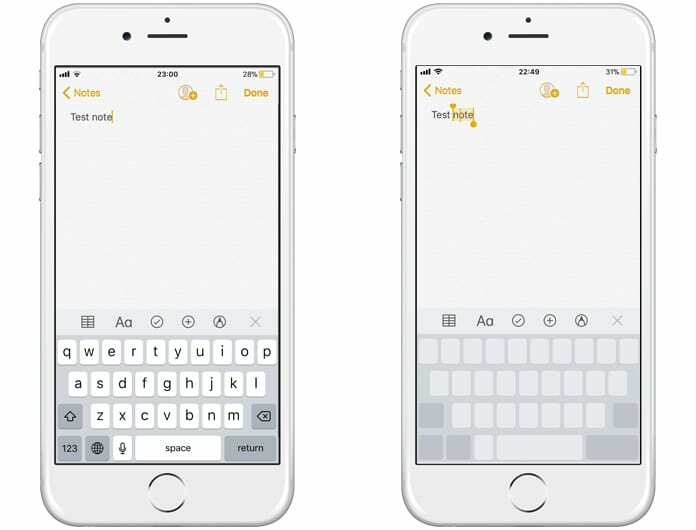 The built-in Text Replacement feature expands snippets of texts into longer sentences. 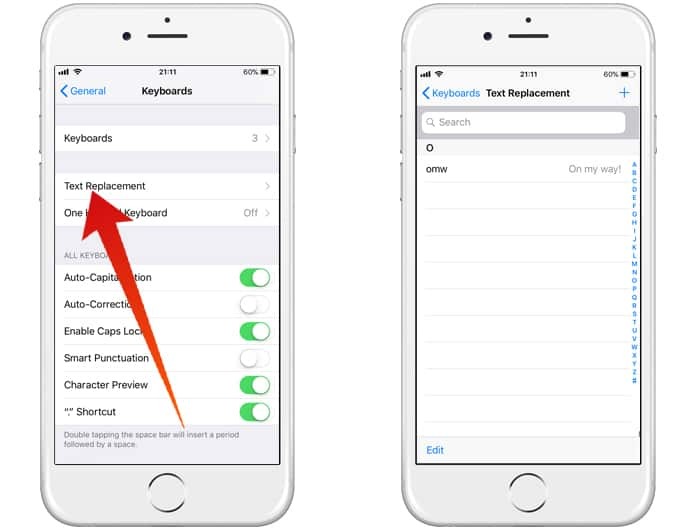 Go to Settings -> General -> Keyboard -> Text Replacement and hit the + button. Enter your desired shortcut and the phrase and save it. 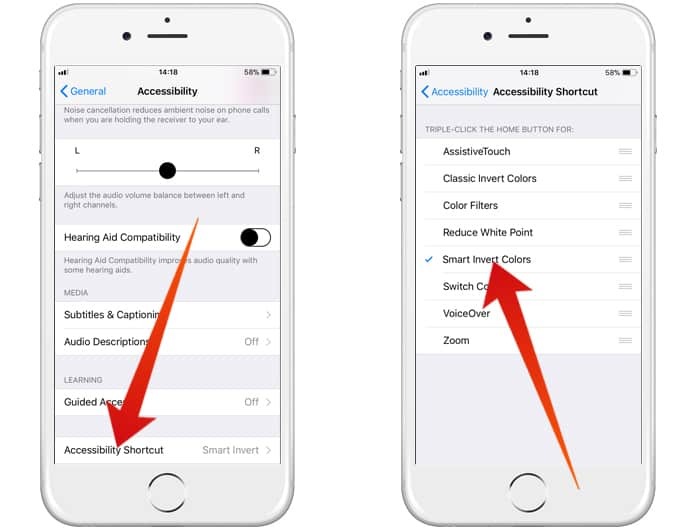 It is possible to enable a shortcut that brings up a selection to quickly assess your favorite accessibility feature. Just go to Settings -> General -> Accessibility -> Shortcuts and add the features you want. 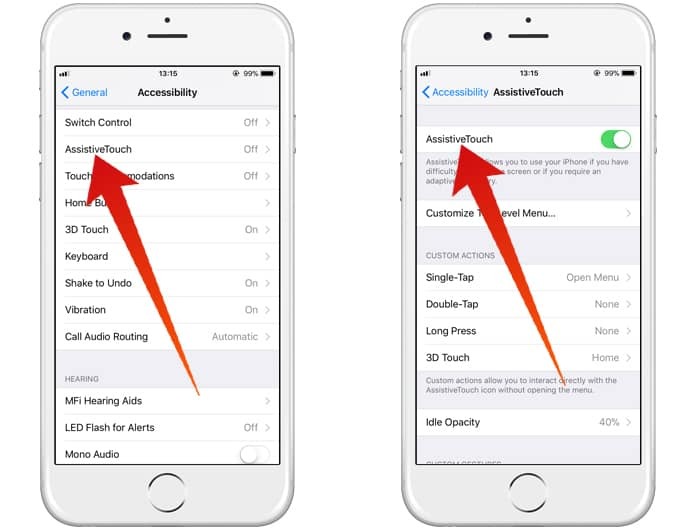 Go to Settings -> General -> Accessibility to access the AssistiveTouch feature. What it does is adds a virtual Home button. This virtual home provides additional options, like you can define what happens when you tap, double tap or long press the virtual home. Jailbreak for the iOS 11 isn’t available at the moment but it should be soon. If you have the iOS 10.2 or older and it is jailbroken there are some neat new tricks you can try out. 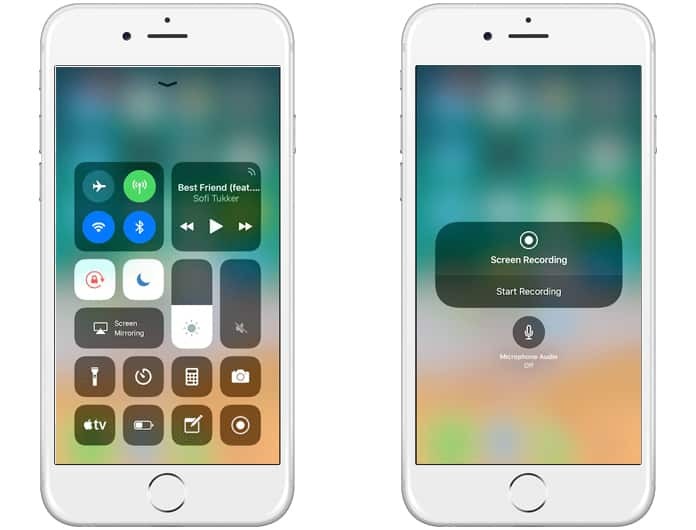 The iOS 11 has a hidden feature that allows you to customize the Control Center. 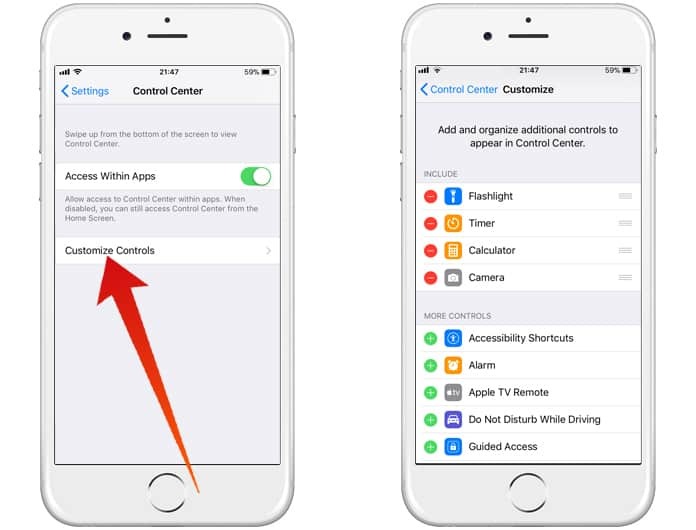 Go to Settings -> Control Center -> Customize Controls and there should be a list of features to add to the bottom of the Control Center. In case you are running low on storage space on your iPhone, it is possible to backup photos to an external drive! Go to Settings -> Control Center -> Customize Controls. When in the Control Center just tap on Screen Recording which will cause screen recording to start in 3 seconds. Just tap on the status bar to stop it. We hope that you liked our list of the best iPhone hacks and tips. Please remember to like, share and comment!